The new WWE Champ, Randy Orton, heads to the ring. Orton takes a second to milk the smattering of “boos” before telling Bray Wyatt that he will never forget Orton’s name. Bray Wyatt appears on the tron and reminds Orton of their rematch. But first, he has something special planned. He wants to watch Orton cry and his soul devour itself. He wants to fight in a House of Horrors match. Orton accepts the challenge without clarifying what a House of Horrors match is. He then calls Wyatt to the ring. The lights go out and Wyatt appears behind Orton. They brawl, and as Orton starts to get the advantage, Erick Rowan appears at ringside to help Wyatt. Luke Harper then rushes to the ring and manages to clear Wyatt and Rowan out to the floor. Harper and Orton stand in the ring while Wyatt and Rowan back away up the ramp. Renee Young asks The Miz and Maryse for their reactions to Cena’s proposal to Nikki at Wrestlemania. They say that they pushed Cena to the point where he had to propose. Miz then challenges Cena and Nikki, promising that this will be the last time anyone sees them on SmackDown. Pretty good match. I liked how Alexa kept going after Naomi’s le and how that played into the progression of the match. Naomi with an injured leg might make for a little less of an energetic match than is usual for her, but it can help make the action more interesting to follow. Curt Hawkins, already in the ring, complains that the WWE Universe is hearing too much about the “superstar shakeup” and not enough about him. So he decides to issue an open challenge to anyone in the locker room. He gives it to a count of ten. Naturally, “The Perfect 10” Tye Dillinger comes out and makes his way to the ring! This was practically a squash, but it was a good debut for Dillinger. He overwhelmed Hawkins with speed which kept the very short match entertaining. I’ve never been the biggest fan of Dillinger, but I like him and am excited to see what he brings to SmackDown. He has the fan support, which is well deserved, but I hope his character can grow given the extra space and time afforded by being on the main roster. Dasha Fuentes welcomes Mojo Rawley and asks him about winning the Andre the Giant Memorial Battle Royal. He says the whole experience has been unreal. He talks about his celebration and how great Andre the Giant was. Mojo says he’s had his Wrestlemania moment, but he’s just getting started. John Cena’s music plays, but Miz and Maryse come out in Cena and Nikki Bella cosplay. Miz (as Cena) announces that Cena and Nikki are leaving WWE and going away for a very long time. As Miz and Nikki leave the ring, a man playing a violin (Lee England, Jr.) appears on the stage. 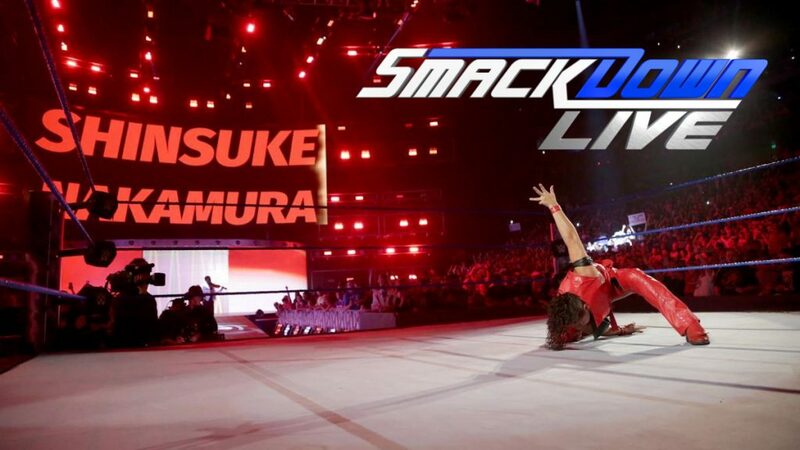 The lights go out, and Shinsuke Nakamura heads to the ring! Miz and Maryse quietly leave the ring area as Nakamura soaks in the adulation of the crowd. This was arguably better than their Wrestlemania Kickoff match. The street fight stipulation fit much better with the feud they’ve had, and the violence in the match was entertaining. There were tables and chairs everywhere, but the match never devolved into a housekeeping session where they keep setting up elaborate structures. It was straightforward and fairly hard-hitting, which is perfect for these two guys. Shane McMahon heads to the ring. He talks about the “superstar shakeup” and how every RAW superstar should be hoping to get traded to SmackDown, the “land of opportunity.” AJ Styles then comes out and heads to the ring. Styles says he doesn’t want to go anywhere during the superstar shakeup, he wants to stay on the show that he built. He also says that he owes Shane something, so he holds out his hand. He and Shane shake hands, then Styles smiles and walks away. Austin Aries says that he’s going to once again become the number one contender for the Cruiserweight title tonight on 205 Live. This was a fine match, but it’s another example of Bray Wyatt’s “magic” not having any effect on Orton. Is this leading somewhere? Presumably whatever the House of Horrors match is will have something to do with Wyatt’s recent ineffectiveness, but that remains to be seen. As far as this being a rewatchable match. Meh, not so much. Not a bad show, but except for the debuts it didn’t feel like a particularly special episode. A good episode, but maybe not a “SmackDown after Wrestlemania” level episode. This was an entertaining match, and the fact that it made up for a somewhat disappointing match on the Wrestlemania Kickoff made me like it even more.